As expected, the Huawei sub-brand Honor has finally launched the affordable smartphone, called with Honor 7S in the Indian market on 4th September. The Honor 7S is modified name of Honor Play 7 that was launched in China and Pakistan in the month of May. The smartphone has appeared on the internet several times in the form of leaks. It comes with features such as Tap to Wake Up/ Sleep and Automatic Apps Split. The key highlights of Honor 7S include 3,020mAh battery, 18:9 aspect ratio, a selfie LED flash and a 13MP rear camera. Honor 9N and the Honor Band 3. The contest is valid till 7th September 2018. To participate in the spin contest, the users initially will have to sign up an account and they will get daily three chances to spin the wheel and must try their luck till 7th September 2018. As of now, we don’t know the price of the Honor 7S, the Honor 9N is retailing at Rs 13,999, the Honor Play is retailing at Rs 9,999, the Honor Band 3 costs around Rs 2,499. The Honor 7S and the Honor Play 7 are identical to each other in terms of specifications, design, hardware but the former features slighter lower specifications in the front- camera department. The Honor 7S features a 5.45-inch HD+ Full View display but the notch is missing in the smartphone. The smartphone offers 18:9 aspect ratio and the screen resolution of 720 x 1440 pixels. In terms of software, the smartphone run on top of the line Android 8.1 OS. The Honor 7S packs a 13MP rear camera with features like LED flash and phase detection autofocus. Up front, the smartphone gets a 5MP selfie camera. The connectivity options on the Honor 7S include 4G LTE, Wi-Fi 802.11 b/g/n with hotspot, GLONASS, GPS, Micro-USB, Bluetooth 4.2 with LE and a 3.5mm headphone jack. In India, the Honor 7S has been priced at Rs 6,999 and the buyers can choose between three color options Blue, Black, and Gold. As expected, the recently launched Honor 7S is now available for purchase in the form of flash sale for the first time in India. 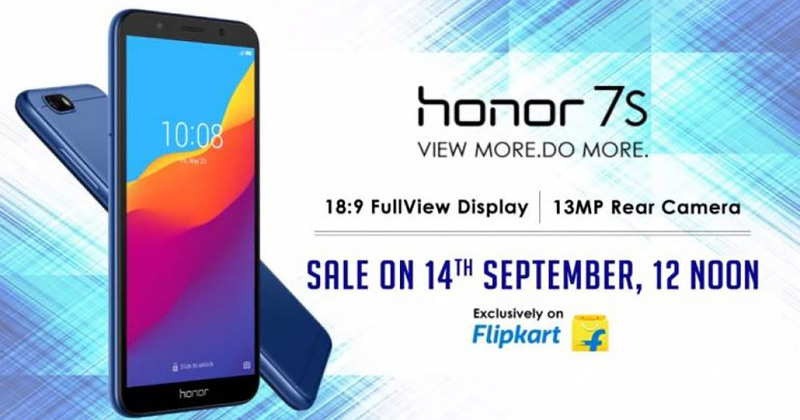 The first flash sale of Honor 7S is starting today at 12 PM IST (Noon) on Flipkart and the official website of HiHonor store in India. A minimum discount of Rs 1000 has been listed on Flipkart in exchange for an old smartphone with the budget segment Honor 7S. Axis Bank Buzz Credit Card Holders are entitled to avail an additional discount of Rs 200 while purchasing the smartphone from Flipkart. Furthermore, Jio subscribers will get a cashback offer of Rs 2,200 from Reliance Jio bundled with 50GB internet data. All of the aforementioned offers can be availed at Flipkart on the purchase of Honor 7S.